Home > Wool > Another record for wool. 20 Nov Another record for wool. AWEX identified an interesting statistic this week; the turnover of wool sold this week of $96 million was the largest since 2002. The kicker is that while this week it was generated by the sale of 49,000 bales, in 2002 it was on the back of an offering of 74,500 bales. So, a similar $ value heading back to rural Australia but 33% less bales produced. 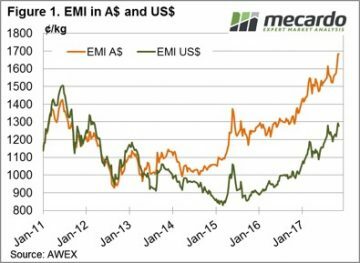 It was a steadier week with the Eastern Market Indicator (EMI) finished the week at 1,683¢, gaining 2 cents and AWEX reporting this another new record high in Australian dollar terms. The Australian dollar was slightly lower over the week, with the EMI in US$ terms losing 13¢ to end the week at 1,279¢. Again, a small pass-in rate this week of only 3.2% of the offered bales, resulting in 49,009 bales cleared to the trade. This is one of the largest weekly sale volumes for this selling season, with only the first week after the winter recess larger. Fig 3. Some of the recent “heat” dissipated from the market this week with reports of “mixed results” where quality again was a factor; or more accurately lower quality wool at times struggled. This has been a pattern for the year however in recent weeks when the market rallied lower grades were supported. Crossbred wool fell sharply losing as much as 50 cents reflecting the volatile nature of this sector. In contrast, Cardings continue to improve and set new records with all centres showing strong lifts across the week. We have commented previously that the current market conditions are unique in our time of observation. Supply is moving through the system quickly; that is there are little stocks held either on farm, in broker stores or in mills. Sheep farmers are experiencing record income inflows; with not only wool prices good but so too are sheep and lamb prices. 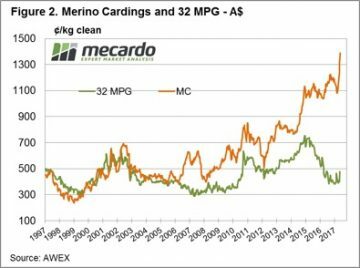 This will mean that any retracement in price in the future will be met with “cashed up” wool producers holding back wool from the market and reducing supply to processors. As we said, these are unique times where it could be argued that the producer is able to influence the market by withholding supply. The qualifier is that any supply “squeeze” may have short term market influence but it is unlikely to be a long term positive factor on price. In the end, customers will adjust orders to meet supply and pay a price that works for their customers at retail level. 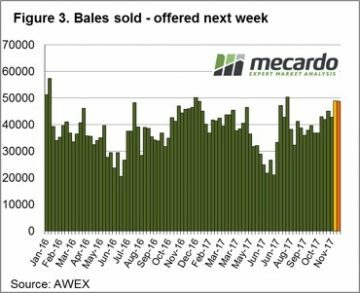 The big offering this week is to be followed by another 48,700 bales rostered for sale next week across the three selling centres (Figure 3). The roster then lists 44,000 for the following two weeks. Of note is the strong report from Fremantle this week, generally a solid market on Thursday in W.A. with the 3-hour time delay to the East Coast is a good lead for next week.